THIS PRODUCT IS FOR COMMERCIAL USE ONLY! IT GRANTS A LICENSE TO USE THE PRODUCT ON 3 PC'S CONCURRENTLY WITHIN YOUR ORGANISATION. This version of the product is ONLY COMPATIABLE with X-Plane. It allows you to connect your GoFlight hardware to X-Plane allowing full access to all X-Plane Datarefs and Commands. Moreover, you can create custom events to interface to more advanced aircraft that have created their own DataRefs and Commands. This allows a much greater chance of interfacing your GoFlight hardware to more modern and advanced add on aircraft. The Detective function in the product, allows you to monitor in real-time what DataRefs are changing allowing you to know what to change/monitor for interfacing to your GoFlight hardware. It also allows you to create custom events (e.g. your own XPlane Commands) consisting of DataRef changes, Commands, key presses or calling other custom events. A full on-line user guide is available here. Pre built configurations for other aircraft are available from the downloads area. Monitor an aircraft power variable to have all your GoFlight equipment power up or down. 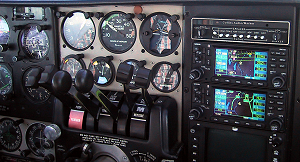 Also monitor a separate variable to control devices that only power up when Avionics power is available. Support for push and hold on suitable rotaries. Due to a recent change in EU law we are currently exempt from charging Tax/VAT.